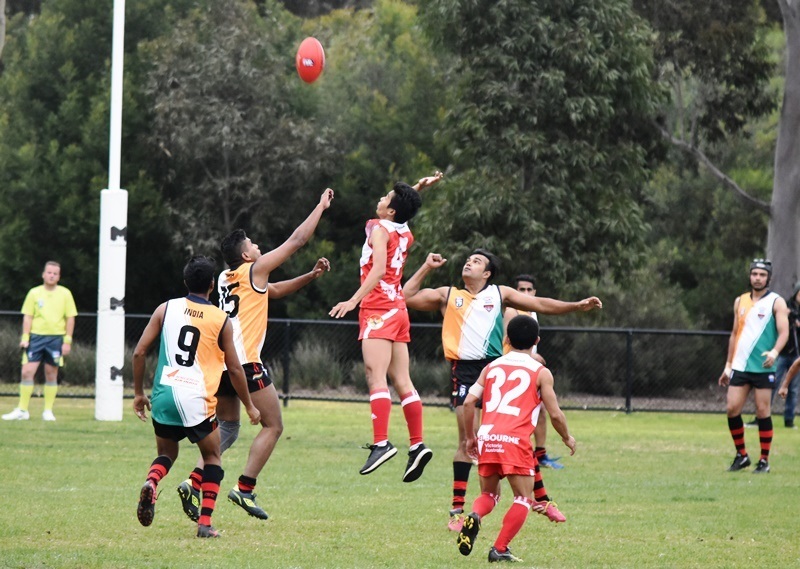 As 3rd place and 4th place getters of their respective pools Indonesia and India played the Semi-final 3. match at Western Oval, 16th August. Indonesia went into this match as warm favourites on the form of their win over Sri Lanka and because India had lost to Pakistan on Saturday in round three. Ruck contests were pretty even but Indonesia were able to gather more first use of the ball and were consistently quicker with both hands and feet and quickly moved the ball into their forward fifty and were able to score several quick goals, one each to Waruwu and Hariyanto. The Garudas continued to penetrate the forward lines with speed and accurate kicks and handballs, meanwhile their defence held firm and repelled any Indian advance toward goal. The second Quarter was much similar to the first with Indonesia continuing to pressure and shut down any Indian attacks whilst continuing to score consistently with goals to Abdillah and Santoso. 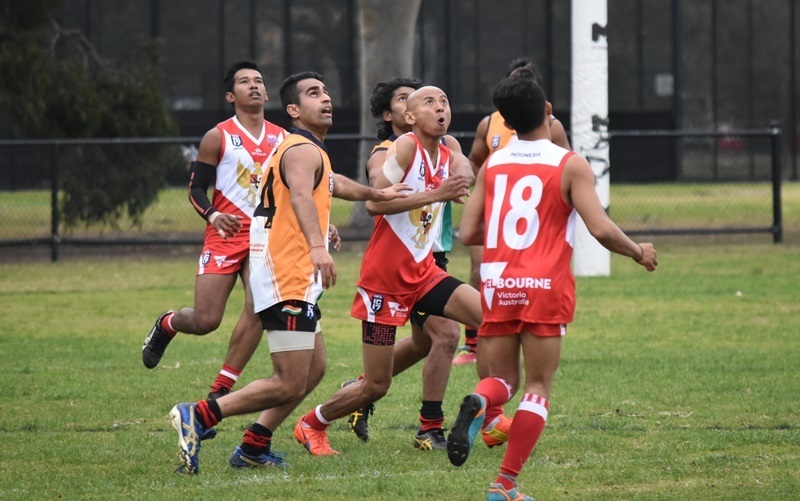 The third quarter was the Bombers best quarter of the match as they made a conscious effort to shut down Indonesia’s forays into their forward zone and were quite successful, restricting the Garudas to just 2 behinds for the quarter while managing one goal (Jasim Akhtar) 2 behinds themselves. 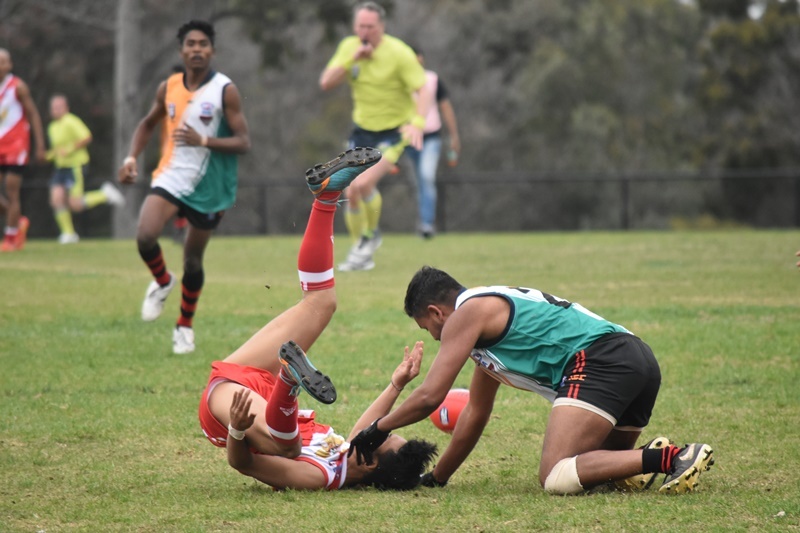 Last quarter saw the Garudas regain the ascendancy and after an incident (didn’t see what actually happened) in which 2 Indian players were yellow carded were able to run out the game comfortably. Abdillah and Santosa scored for Indonesia and Malhotra goaled for India. Official Best Players and Goal Kickers not yet available. Best amongst Indonesia were, Waruwu, Abdillah, Septiadi, Santoso, Ze Bua, Hariyanto and Frans. Best for India included, K Singh, Fernandes, Sharma, Shah, P Singh and Chakraborty.